Bangladesh, a developing country from South Asia, has become a ‘focus of attention’ to a steadily increasing global power named China which is an emerging catalyst of policy management in Asia. China has been able to flourish its economic, political, military and cultural posture in such a height that, it is getting tough to compare the states’ strength with any other state as it is assumed that, China will surpass the USA in the next twenty years if her economy increases in the same rate. Probably, to become the most powerful state of the world, China is trying to make and develop diplomatic ties with states from Asia, Africa, Europe and Latin America. In that South Asian part, China has particular and strategic foreign policy combinations as it is the most favorable region for her interest to be fulfilled. The ongoing bilateral and multilateral relations with the Asian states like Myanmar, Pakistan, Sri Lanka, Nepal, Singapore, Thailand, Bangladesh etc. in respect of economic, political and military cooperation indicates the great strategic motives of China. A lot of articles, reviews, researches are there about Bangladesh-China bilateral relations. In most of the articles and books about Bangladesh-China relations, historical events of building up of mutual relations, cooperation measurement, and the future of the relations have been articulated with enough data and information. In this backdrop, this paper tends to portray the Bangladesh-China relationship as the relation is not existing as a normal picture, but there is something really critical to think off. Developing the partnership with Bangladesh and improving economic strength is not the only factor for China, but there is something particular in Chinese policy that is more strategic and broad in respect of South Asia. The ultimate goal of this paper is to find out those crucial purposes of China’s increasing bilateral partnership with Bangladesh. The bilateral relation between Bangladesh and China has reached a new height in the recent period although the situation was not up to the mark since the independence of Bangladesh. A great turnover has occurred in the economic and military partnerships between the two nations in different political regimes. Ideological affinity is not a fact at all in building up a mutual relation between Bangladesh and China as they are totally different in their culture and ideological perceptions (Chakma, 1996: 257). But what are the facts that have a magical power to connect two countries one of which is the second powerful state of the world and another is a third world state? Obviously, there are some reasons that trace out the answer of the question. To pursue economic gain is one of the most crucial things that has made it bound both China and Bangladesh to cooperate with each other. Bangladesh is a source of cheap labor and natural resources, where China’s economy has bloomed immensely through garments, technology, agriculture etc (Aneja, 2006: 6). Another most highlighted issue in the recent time is the security concern of the both vis-à-vis India. Although India is a trusted partner, her increasing national power and dominant attitude in Asia has become a matter of concern and insecurity for Bangladesh as a neighboring state. India is also a perceived threat to China as the foreign policy of India is designed in such a manner that she will not accept any external dominance in this part of the continent. From that particular perspective, the relation between Bangladesh and China is deepening day by day. This paper is all about the increasing development of China-Bangladesh diplomatic affinity in the early Twenty-First century. It is a time frame from 2001 to the present date and the period is important to articulating as the two dominant political parties Awami League and BNP were in strong position to build up a good relation with China. Chinese foreign policy also took a shift toward Bangladesh as a South Asian nation. After a brief conceptualization of Bangladesh-China bilateral relations since 1975 to 2001, strategic partnership between the two countries in the fields of economy, security, technology, and culture has been attempted to express. And finally, there is an important discussion that has been termed as ‘a China motive’. This will help to grab a very critical perception of China’s building up of a strategic partnership with Bangladesh. Thus, it is hoped that this paper will add something new about the bilateral relations between Bangladesh & China, and, at the same time, Chinese ambition in the South Asian region. A bilateral relationship was not so smooth between Bangladesh and China since the emergence of Bangladesh as an independent nation. Because of China’s strategic standing, she used her veto power in the United Nations on Bangladesh’s membership as a sovereign state. China’s position against the emergence of Bangladesh as an independent state can be summarized in the following ways- A) China had a faithful relationship with Pakistan after the Sino-Indian war in 1962. Pakistan became an ally of China and China saw her future in South Asia through keeping a good tie with Pakistan. That’s why China didn’t want the breakup of Pakistan as this might interrupt her interest in this region. B) As the relation between the West and East Pakistan was not up to the mark, East Pakistani leader Shiekh Mujibur Rahman sought help to the Indian government. The concern to the Chinese was that, if India helps East Pakistan or Bangladesh to be independent, it might incur her interest and India might emerge as a threat to her. C) Indo-Soviet amity after the Sino-Soviet split in the 1960s was also a great factor of China’s standing against Bangladesh. As India had very good relationship with the Soviet Union, Dhaka ultimately got a scope to be a close friend of the USSR. This Indo-Soviet tie made China nervous in acknowledging Bangladesh as an independent nation. 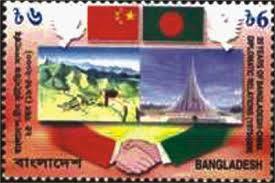 China and Bangladesh established diplomatic relations in January 1976. It was the period soon after the assassination of Sheikh Mujib in 1975 that China officially recognized Bangladesh as an independent state (Kiesing’s Contemporary Archives, 1974: 26610). It is often been argued that China changed her policy toward Bangladesh because she wanted to incur the friendly relation between Bangladesh and India. Whatever the reason was, China marked her considerable and positive attitude toward Bangladesh in 1975. Since then, both China and Bangladesh have tried to establish good relationships with each other and it’s going on. Since 1975 to 2000, there were three political regimes in Bangladesh which had remarkable contributions in developing a partnership with China. Chinese Communist Party (CCP) also had an important role in building up relation with Bangladesh (Downs and Saunders, 1998/1999: 114-146). A preliminary agreement to establish relations in late 1975 led to an exchange of diplomatic missions in 1976. The trend in China toward a more open foreign policy during the 1970s also paralleled the Bangladeshi move toward neutralism under Zia, who visited Beijing in 1977. Support was badly needed for a fully shattered Bangladesh. In the Zia period, soon after the coup of 1975, China immediately accorded recognition understanding foreign policy orientation of the new regime (Jain, 1981: 232-236). For China, to lessen Indian and Soviet influence in South Asian part was one of the most crucial parts of developing a relationship with Bangladesh. The first diplomatic support of China toward Bangladesh was on the Bangladesh-India dispute over the construction of the Farakka barrage by India upstream on the Ganges River. Chinese Charge d’affaires in Dhaka stated explicitly that, “We firmly support the reasonable stand taken by Bangladesh on the question of sharing of waters of the Ganges River”. With the establishment of political relation, bilateral relations soon spilled-around in other sectors like economic, military, culture etc. China had a healthy economic relation with Bangladesh in the 1980s as China offered a concessionary trade to Bangladesh. On 25th November 1975, a contract was signed to supply 10,000 tons of jute, which was increased to 24,000 tons by another pact in February 1976 and later on agreed to 50,000 tons of jute per year on a regular basis in return for rice and other consumer products (Chakma, 1996: 268-269). Although Sino-Bangladeshi security relations have remained informal, the two sides have regularly exchanged high-level military delegations to review relations, negotiate weapons transfers, inspect military facilities, and cement personal contacts. By mid-1980s, Bangladesh had become a major procurer of Chinese military hardware and also supplied it with military aid and equipment. Between 1975 and 1979, China supplied 78% of Bangladesh’s arms imports (Gilks and Segal, 1985: 167). Relations between Bangladesh and China continued to flourish with the new president of Bangladesh Hossain Mohammad Ershad took over power. China had a special importance to Ershad not only because she used to provide Bangladesh huge arms, but also the Ershad regime had a bitter relation with the Soviet Union. After Ziaur Rahman, President Ershad was warmly received in July 1987. A Bangladesh-China friendship bridge constructed and inaugurated over river Buriganga was a token of an advanced diplomatic and military relationship between the two. Consequently, the relation between Bangladesh and China developed day by day in Ershad Period. Ershad paid 5 visits to China during his 9 years period. Economic cooperation also flourished during this period. A Joint Economic Commission was established on 2 November 1983 for more vigorous cooperation in the economic field. Trade volume increased significantly during this period as from 1983-84 to 1990-91, Bangladesh imported from China goods worth of TK. 20,552 million, while the value of export was TK. 4,961 million. Six important barter protocols were signed in this regime. In November 1989, Premier Li Peng paid an official goodwill visit to Bangladesh, during which both sides signed the Agreement on Mutual Exemption of Visas and the Agreement of Trade. A more developed defense relation was established between Bangladesh and China during the Ershad regime. By 1987, the Bangladesh Army possessed nearly 20 Chinese made T-59 tanks, the Air Force had 18 Shengyang J-6 FGA and CT-6 training aircraft and the Navy is equipped with 15 Chinese built FACP-6 Hainan and 8 Shanghai 2 and 4 Chinese made FAGG. From 1987-91, Bangladesh received $355 million worth of arms from China that was of 68% of the total arms procurement of Bangladesh in that period (Mahapatra, 1988: 1422). After the Ershad regime, the status quo between Bangladesh and China have remained same not considering which party in power during the Khaleda Zia or Sk Hasina period. After Khaleda Zia coming to power, she made her first foreign trip to China which posits the strong partnership of mutual cooperation. During her talks with the Chinese leadership, Khaleda Zia expressed her thanks to China for providing assistance when Bangladesh suffered hurricane in 1991 (The Bangladesh Observer, 1991). The Chinese leadership stressed that it would be a consistent policy of China to develop friendly relations with Bangladesh, which would by no means be affected by the changes of either international situation or domestic situation in Bangladesh. After Sheikh Hasina led government the Awami League coming into power, it paid importance to the friendly ties with China and the Sino-Bangladesh relations continued to develop stably. In September 1996, Prime Minister Sheikh Hasina paid an official goodwill visit to China, which was her first visit to foreign countries after assuming the Prime Minister’s office. The Prime Minister expressed gratitude to China for its assistance to Bangladesh and her willingness to learn successful experience from China in developing the national economy. During the visit, two countries signed the Agreement on Encouraging and Protecting Investment, the Agreement for the Avoidance of Double Taxation and the Agreement of the Prevention of Tax Evasion. In April 1999, Mr. Li Peng, Chairman of the Standing Committee of the National People’s Congress of China took an official goodwill visit to Bangladesh and stressed that any support and assistance was always mutual. He expressed appreciation and thanks to Bangladesh for its consistent position of supporting China in the issues of human rights, Taiwan, Tibet, etc. Relations between Bangladesh and China reached in a remarkable position in the very early period of the Twenty-First century and it is still an ongoing process. Policies and strategies of both states have changed towards each other with the development of globalization. It is because the countries have found it important to maintain a status quo position so that the maximum interest can be ensured. For Bangladesh, China has become a very crucial source of her export and import of arms, technological commodities, agricultural products and sometimes, cultural imperatives. For China, Bangladesh is not only a source of cheap labor and natural resources but also a part of Chinese great strategy in South Asia (for example- the ‘One Belt One Road’ initiative, the ‘String of Pearls’ initiative etc.). And the most important thing which is very common in both the state’s policy is to deter India creating a ‘hegemony’ in this part of the globe. The following part, which is the main part actually, is going to discuss how the partnership has taken a new turn between Bangladesh and China from the beginning of the new century till the present date. This is basically a discussion of the more developed bilateral relations between the political parties of both states. It is just to justify here that, China doesn’t care about which political regime is in the ruling position in Bangladesh. In December 2002, the then Bangladeshi Prime Minister Begum Khaleda Zia made visit to China which was significant in the bilateral relations between the two countries. According to a Memorandum of Understanding, China promised Bangladesh a 100 million Yuan, in addition to the previously sanctioned interest-free 50 million Yuan for constructing the sixth Bangladesh-China friendship bridge on the river Dholessori. In the 2001-02 economic year, Bangladesh’s imports from China were worth 657.78 million USD while its exports were worth 19 million USD. In 2004, Bangladesh’s trade volume amounted to 1.96 billion USD, an increase of 43.5 percent from the previous year, and China’s exports to Bangladesh stood at 1.9 billion USD, up 42.8 percent from 2003. Chinese imports from Bangladesh totaled 57.01 million USD, an increase of 70.7 percent (Chesham and Mahabubur, 2005). China-Bangladesh trade volume reached a record high of 10.3 billion US dollars with a growth rate of 21.9% compared with 2012, 10 times that of 2002. In 2005, China emerged as the number one import source for Bangladesh, overtaking India for the first time. While Bangladesh’s imports from China amounted to 2078.99 million USD during the 2005-2006 fiscal year, imports from India amounted to 416.6 million USD (Kumar, 2006). In the fiscal year of 2015-16, export from China amounted to 808.14 million USD and the import amount was nearly 11602.23 million USD, which broke all the record of the past. Under the Bangkok agreement of 2006, China provided duty free access to 84 Bangladeshi products in order to reduce the trade imbalance. China also decided to give concessions to Bangladesh under APTA, which is an initiative of the Economic and Social Commission for Asia and the Pacific (‘Duty-free access to China’, The New Nation, 25 April 2006). Bangladesh mainly imports raw materials for its textiles and clothing from China, such as cotton, yarn, fabrics, staple fibers and accessories for its readymade garments (RMG) industry, which is nearly 35 percent of total imports (Kabir, 2016). On the export side, the top five items constituted about 80 percent of total exports in 2015-16, of which 42.2 percent is woven and knit garments as per the double-digit harmonized code. At present, in Bangladeshi markets, different kinds of Chinese technologies like mobile phone, vehicles, computers, televisions, watches, lights, batteries, fans, freezes, ACs and a large number of electronic devices and technological accessories are very much available. Thus, a complementarity is evident in the export and import items, which is believed to create synergy especially in Bangladesh’s export-oriented RMG industry. Bangladesh is basically sourcing raw materials and machinery for its textiles and clothing sector. In 2007, Chinese Assistant Minister of Commerce, Wang Chao visited Bangladesh with the 39-member purchase delegation. It is the biggest purchase delegation ever to Bangladesh with over 10 companies listed in China’s top 500 and some of them in world’s top 500. Delegation is reported to have purchased Bangladeshi goods worth over USD $50 million. Both countries accepted to build a ‘Bangladesh-China Friendship Exhibition Center’ in Dhaka (The Hindu, 2007). China laid out a red carpet welcome for Prime Minister Sheikh Hasina on her third visit to here in June 2014. Both leaders pledged to step up financial assistance and involvement in infrastructure projects in Bangladesh. Chinese Premier said that Bangladesh would be ‘an active partner’ in a ‘China-led Asian century’. Prime Minister Sheikh Hasina has underlined her willingness to deepen her country’s strategic and economic engagement with China, signing major agreements for the construction of roads, railway lines and power plants on a three-day visit to the Chinese capital. Bangladesh is to seek Chinese help to build deep-sea port. It would cost billions of dollars, if a Chinese company were to be awarded the contract, Sonadia would become the fourth port to be constructed by a Chinese firm in the Bay of Bengal. China has also offered to construct nuclear power plants in Bangladesh to help meet the country’s growing energy needs, while also seeking to aid the development of Bangladesh’s natural gas resources. Six friendship bridges in Bangladesh have been built, and the Seventh is underway. Many other mega infrastructure projects are under construction with Chinese fund and technical support (June 2014). On the aid side, the disbursement from China is attractive. To-date, China has provided Bangladesh US$1.5 billion, of which US$978 million has been as hard loans, whereas Bangladesh had hoped for softer terms (Chowdhury, 2010: 7). The last 14th October, 2016, Chinese President visited Bangladesh. Chinese President Xi Jinping’s visit to Bangladesh is likely to be a landmark one owing to a number of factors. 27 deals on co-operation in a number of sectors, 15 agreements and MoUs (Memorandum of Understanding) and 12 loan and mutual agreement were signed on this visit. China will fund $21.5 billion in 28 development projects and foreign aid, $80.3 million on economic and technical co-operation, $700 million on load agreement for Karnaphuli tunnel construction and $280 million on credit agreement for Dashekandi Sewerage Treatment Plan Project. In 2014, the Bangladesh government awarded China a USD 1.55 billion contract to build the Padma Bridge. Work on this key project is progressing well and is expected to be completed in 2018. In a further deepening of ties with Bangladesh, in February 2015, the Chinese government agreed to finance 10 large infrastructure projects estimated to cost over USD 8.5 billion. China has more than 100 companies that are doing business in Bangladesh in garments, textiles, jute and general manufacturing. If this rate prevails, the total bilateral trade would be USD18 billion in 2021, when the country would celebrate its 50th anniversary (Kabir, 2016). Actually, Bangladesh-China relations are being diversified with various projects and agendas from past to present, fundamental of which is trade and others come to the front with different strategic importance either for Bangladesh or for China. China has emerged as a major supplier of arms to the Bangladesh Armed Forces. China has provided training to Bangladesh’s armed forces and members of both armed forces have undertaken courses in each other’s defense colleges. In 2002, an important ‘China and Bangladesh Defense Agreement’ was signed to meet Bangladesh’s defense requirements. It was the first such agreement signed by Bangladesh with any country, and it helped institutionalize and codify the existing accords in the defense sector. It provided a comprehensive framework for cooperation in training, maintenance and some areas of production. China currently plays a vital role in Bangladesh’s security, as the largest and most important provider of the latter’s military hardware and training of its armed forces. In May 2006, the Bangladesh Army Chief met with the Chinese Defence Minister Cao Gangchuan who stressed that “China and Bangladesh have forged good cooperation and coordination on international issues and China will make joint efforts with Bangladesh to safeguard regional and world peace and stability” (People’s Daily, 2006). China supplied 65 artillery guns and 114 missiles and related systems (The Assam Tribune, October 9, 2007). Most of the tanks (T-59, T-62, T-69, and T-79), a large number of armored personnel carriers (APCs), artillery pieces and small arms and personal weapons in the Bangladesh Army are of Chinese origin. Since 2010, Beijing has supplied Dhaka with five maritime patrol vessels, two corvettes, 44 tanks, and 16 fighter jets, as well as surface-to-air and anti-ship missiles, according to Stockholm International Peace Research Institute. In 2005, 16 F-7BG were ordered and the deliveries began in 2006 (Tiezzi, 2015). In 2008, Bangladesh set up an anti-ship missile launch pad near the Chittagong Port with assistance from China. The maiden missile test was performed on 12 May 2008 with active participation of Chinese experts. It successfully test-fired anti-ship missile C-802A with a strike range of 120 km from the frigate BNS Osman near Kutubdia Island in the Bay of Bengal. In 2014, in the presence of the visiting Vice Chairman of the Military Commission of the CCP, General Xiu Qiliang, four bilateral military agreements were signed. Under these, the Chinese military committed itself to support the Bangladeshi forces with training and equipment. Also, the Chinese undertook to set up a language laboratory at the Bangladesh University of Professionals, run by the armed forces. There have since been several exchanges of military visits at high levels. Cooperation is planned in the areas of anti-piracy, UN peace-keeping, and disaster management (Chowdhury, 2016: 9). Recently a navy fleet arrived in Chittagong and participated in a military drill with the Bangladeshi navy. Prime Minister Sheikh Hasina announced her plan to purchase two submarines in 2013 as part of her government’s move to build a modern navy to defend the resource-rich Bay of Bengal. With the Chinese President Xi Jinping’s official visit to Dhaka on October 15, 2016, which was the first for any Chinese president in 30 years to visit Bangladesh, finally, the way of buying submarines became smooth. Few months later, Bangladesh got two submarines, bought from China, as it seeks to boost its naval power in the Bay of Bengal. Bangladesh paid a reported $203 million for the two submarines, a deal which reflects the country’s growing economic and defence ties with Beijing. During that visit of Jinping, the Senior Colonel Zhang Wei said, “China is not only a reliable and affordable source of weapons and equipment for Bangladesh’s armed forces, but also provides military training and technology” (Sobhan, 2016). Over the years, there have been regular high-level bilateral visits of military officials from both sides. Most recently, Bangladesh Navy chief Admiral Nizamuddin Ahmed visited China to officiate at a ceremony for the construction of two Corvette warships. Further high level visits are expected to take place during the coming months. Thus, Bangladesh and China have, over the last four decades, developed strong military and defence cooperation. Through the discussion above, it’s been clear that, bilateral relations between Bangladesh and China has reached to a glorious height in respect of economic and military cooperation. The relation dictates that partnership between the two states has turned into a strategic position. The following part is to justify that a very strategic portion is persisting in both the states’ policy affiliations. The visit of Chinese president Mr. Xi Jinping to Dhaka on 14-15 October 2016 has ushered the traditional friendship between China and Bangladesh into a new era and bears significant historical importance to the bilateral relationship. The two sides had in-depth exchanges of views on China-Bangladesh relations and international and regional issues of common interest, and reached a broad consensus. The two sides expressed their satisfaction at the traditional friendship between China and Bangladesh and fast development of bilateral cooperation. Based on the common aspiration for and the bright future of the cooperation between the two countries, both sides agreed to elevate the bilateral relations to the Strategic Partnership of Cooperation. Both sides reiterated their adherence to the important principles for developing China-Bangladesh relations, including developing bilateral relations on the basis of the Five Principles of Peaceful Coexistence, respecting and supporting each other in choosing the paths of development according to the national conditions, and respecting and supporting each other’s core interest and major concerns. China appreciates Bangladesh’s commitment to one China policy and its support for China on issues related to China’s core interests and China’s efforts to safeguard its national sovereignty and territorial integrity. Bangladesh appreciates China’s Support for its efforts in maintaining national independence and sovereignty and realizing national stability and development. The two sides agreed to strengthen communication and coordination in regional cooperation. The Chinese side expressed appreciation for the active efforts made by Bangladesh to promote South Asian regional cooperation. The Bangladesh side expressed support for Chinese efforts to enhance cooperation with the SAARC community. The two sides agreed to actively participate in and promote the BCIM regional economic cooperation process. The two sides recognized the commonalities and shared perceptions of the two states in international and regional affairs, including the global financial crisis, climate change, energy and food security as well as issues relating to the aspirations and challenges of developing countries. The goal of the following part is to look for answers of some questions regarding the increasing development in Bangladesh-China relations. State system is primarily based on a realist perspective in which, every state try to maximize their national interest by building up relations with others. We see the same scenario in Bangladesh-China bilateral relation as China perceives building up relation with Bangladesh from a very strategic angle. It has previously been described how China had helped and is still helping Bangladesh to develop her economic and military sectors. There was a vast amount of data about their bilateral initiatives in different times. But does it mean that China provides economic and military assistance to Bangladesh only for her economic gain and to make her economy more strong? Does it mean that China has no further strategic interest in this South Asian region by developing a healthy relation with her South Asian neighbors? The answer is ‘Yes’. China has her particular interest in this part of the globe which we can assume very easily. Here are three key points to make it clear the motive of China of her goodwill relations with her neighbor in the South Asian region. At present, China’s economy is in the second position (about $11.5 trillion) and she may surpass the USA in the next ten years if her GDP grows in the present rate. Chinese long-term intention of ‘peaceful rise and development’ will be possible only by developing her trade and investment cooperation with her neighboring countries. For the foreseeable future, Chinese strategic planners will need to pay increasing attention to China’s Indian Ocean flank. In the short term, China is concerned about its growing dependence on the sea lanes of communications for sustaining China’s economic growth (Cheng, 2010: 1162). There have been some apprehensions among Western analysts of a ‘string of pearls policy’, whereby China would aggressively expand global influence by forging a linkage of ports and bases from the South China Sea (a major portion of which China claims as having fallen within its territorial waters as designated by the ‘nine-dash line’) through the Straits of Malacca, across the Indian Ocean and to the Arabian Gulf as this will greatly help her to increase her oil export to the middle-east. The ‘Kunming Initiative’ evolved into the BCIM Forum for Regional Cooperation during its first with the objective to create a platform where major stakeholders could meet and discuss issues in the context of promoting economic growth and trade in the BCIM region; identify specific sectors and projects which would promote greater collaboration amongst the BCIM nations; and strengthen cooperation and institutional arrangements among the concerned key players and stakeholders to deepen BCIM ties. Indeed, some observers point to the fact that China has sought to bring India into the Kunming Initiative aiming to improve communications, trade and investment links between Bangladesh, Myanmar, China and India (Yuan, 2007). To make the plan successful, China has been able to build up ports in Chittagong of Bangladesh, Gowador of Pakistan, Hambantota of Sri Lanka and port in Burma. Since October 2013, China has made efforts to improve relations with neighboring countries. The principles for China’s foreign policy interactions with neighbors in the coming years are ‘friendship, sincerity, benefit, and tolerance’, and the Maritime Silk Road (MSR) is set to become the diplomatic artery or bridge between China and its neighbors (Lan, 2014: 11). On APEC, 2014, China raised awareness for its ‘One Belt and One Road’ program. The ‘One Belt and One Road’ refers to the Silk Road Economic Belt and the Maritime Silk Road (MSR) of the 21st Century. The Silk Road economic diplomacy is the signature foreign policy proposal of Xi, and in some sense can be seen as the economic pillar of Xi’s grand strategy for rejuvenating China on the world stage. Its stated objective is to promote common development between China and Eurasian countries, particularly in the field of infrastructure development. Establishing various forms and levels of partnership relationships with foreign countries and regional organizations is a distinctive form of Chinese diplomacy. China has also been trying with very skillful and proactive diplomacy to create a new financial order to support the Silk Road project and China’s economic diplomacy in general, including, but not limited to, the establishment of the much vaunted Asian Infrastructure Investment Bank (Zhang, 2015: 122). The most important nation in the South Asian region is India from Beijing’s perspective. Sino-Indian relations have often been rocky since the 1962 war. The confluence of border issues and minority relations has made both the states hostile to each other. China and India are both the rising powers in Asia in their economy, military and other sectors. As India has the largest economy and military power in South Asia, China assumes that India may deter her interest in South Asia. China is more intent on cultivating close ties, including but not limited to military ties, with the various South Asian states than necessarily focusing on surrounding and isolating India. Balancing India is likely to be a growing Chinese concern, not simply for the security of China’s oil lifeline, but also because of India’s overall growth, so Chinese leaders are confronted with the potential of a ‘rising India’ (Cheng, 2010: 1163). It can be inferred that China seeks to strengthen ‘against-India’ regions in order to challenge India’s supremacy in South Asia (Interview of Srikanth Kondapalli, JNU, October 30, 2006). India’s emergence as a great economic success story will provide an alternative, but powerful, model for the developing world, as well as a possible strategic counterweight to China. India’s nuclear weapons capability is quite clearly not driven by the nuclear powers in the UN Security Council other than China (Pei, 2011). Tibet has been a source of continuing friction between China and India. South Asia has become an arena for the rivalry between China and India. Hostile relations between India and Pakistan, Beijing’s involvement in it through its military and nuclear assistance to Pakistan, its role in Sri Lanka, China’s actions in Nepal, Myanmar and in the Maldives have all added to New Delhi’s threat perceptions from China. For China, the only way to counter India as a rising hegemony is to improve relations with its neighbors and seek its own ‘peaceful rise and development’. China is doing the same thing brightly by developing relations with Bangladesh, Pakistan, Nepal, Myanmar, Thailand, Malaysia, Singapore and others. South Asia is achieving increased global importance encapsulating as it does around 1.5 billion people who represent one quarter of the world’s population. Geographically, it is well defined and distinct geographical region with diversified physiographic characteristics and diverse flora and fauna. Due to its strategic location and natural wealth, the region has acquired a very important position from a geo strategic point of view. External powers such as China, Russia and the US, to increase their economic stakes, seek to engage South Asian countries with respect to security and energy issues in West and Central Asia, the Indian Ocean and Southeast Asia. For China, to protect the rise of the hegemony of external powers is also a reason of her developing mutual relations with the South Asian countries. Indo-US and Indo-Soviet relations have become a worrying matter for China and all the states have an equal interest in South Asia. The January 2015 signing of the ‘Joint Strategic Vision for the Asia-Pacific and the Indian Ocean’, committing the U.S. and India to cooperation outside of South Asia, was a landmark agreement (Curtis, 2016). It specifically mentioned ‘ensuring freedom of navigation and over flight’ in the South China Sea, confirming their mutual commitment to maritime security and to curbing China’s maritime and territorial ambitions. China knows that, the U.S. should take advantage of deepening ties between India and the U.S., particularly under the current Modi government. Thus, protecting the rise of other powerful states in South Asia is the reason of China’s increasing bilateral partnership with Bangladesh and other South Asian countries. Since the establishment of diplomatic relations over 40 years ago, Sino-Bangladesh relations have expanded significantly to cover a wide range of subjects. The Chinese people, in their pursuit of the Chinese dream of great national renewal, stand ready to support and help all other peoples in Asia to realize their own great dreams. Mao’s radicalism, Deng’s pragmatism, Hu’s harmonization and Xi’s ‘China Dream’ followed a pattern within the larger framework of the Revolution that has led to China’s reawakening. China has emerged as a reliable partner to Bangladesh extending economic, military and diplomatic support while simultaneously attempting to gain a strategic foothold in south Asia and benefit from Bangladesh’s natural resources. After discussing assessing the Bangladesh-China relations we can realize that both China and Bangladesh wants each other for their won national interest. As China is a growing economic giant Bangladesh needs her because she is also a developing country. On the other hand, China needs Bangladesh for their market and geopolitical strategy. Bangladesh has continually demonstrated its interest to maintain close and friendly relations with China, and as far as possible to partake in the ever expanding political, economic and defence relations between the two friendly nations. Also, Bangladesh needs to attract Chinese investments in to Bangladesh and also improve connectivity between China and Bangladesh. Thus ties between the two friendly nations will undoubtedly continue to grow, and do so for many more decades to come.